I took some pictures, of course! I looked left and saw...Daleks! Not only that, my favourite 'Christopher Eccleston' era ones! 'Ere, who nicked my sucker? Me - next to a dalek - for scale, I am 5 foot 11 inches tall! And of course, opposite, was a Tardis!- it was amusing having my sister with me as she is a GP, so we had the doctor and the Tardis! On to the gallery- the first Kids TV hero, Muffin the mule! And from 'The Clangers'- The Soup Dragon! The Froglets - and the top hat they come from! Major Clanger and his wife. Small Clanger in the music boat, and Tiny Clanger. Bagpuss next, this is Madelaine the rag doll, with Charlie mouse. Bagpuss! - the saggy old cloth cat puss, saggy, and a bit loose at the seams! Sorry - the picture of Gabriel the Toad didn't come out! Some pictures of Noggin the Nog. Tom the Cabin Boy, and the Captain. It certainly took me back to my childhood in the 60s and 70s! Last week, a Bank Holiday weekend in England, I visited my sister in Cheshire. On the Saturday, we went to the Imperial War Museum branch in Manchester. It was very dark inside! - my indoor pictures reflect that! 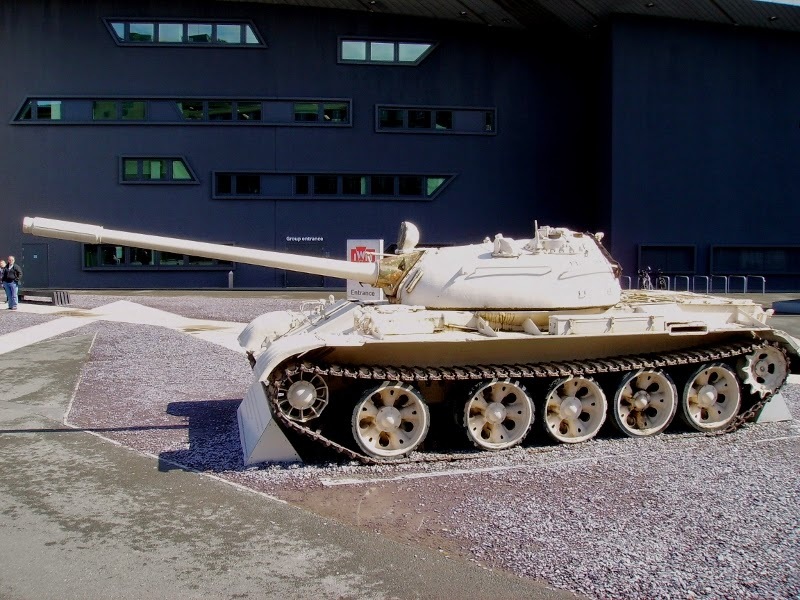 Outside, an ex Iraqi army T-55! In the 'Foyer' -a searchlight. The display cases often had 2 halves, with artifacts from related conflicts. An AK-47, RPG-7 and LAW. Vietnam relics? British gear from the Iraq conflict. A WW1 Royal Horse artillery 13 pdr gun. A WW1 German Stormtrooper display. Note the Bergmann MP-18 sub-machine gun! The ship's bell from HMS Iron Duke, a WW1 Dreadnought. Back to the land campaigns of WW1, a German heavy machine gun. Some German small arms, including the iconic 'Luger'! A heavy German 25cm Trench mortar. Some German machine guns used in Zeppelins. An RFC pilot's gear, with a German planes rudder! British WW1 infantry blouse and equipment. A WW2 Russian Tass poster. A T-34/85 tank. The colour is warped by the light, its really Russian green! Note the rough finish...who needs Zimmerit paste! A Wellington bomber's front gun turret. A Merlin engine, the advancing versions of this excellent engine powered great planes like the Spitfire, Hurricane, Lancaster, and of course, the Mustang D! The 1950's jet engine. However good the propeller driven plane, planes powered by jet engines were faster, and often forgotten is the fact that jet aircraft were less fatiguing to fly due to the lower cockpit noise level 'Jet jockeys' had to endure. A Bren gun and Lee-Enfield, used during WW2 and Korea by British and Commonwealth forces. British headgear, from the same period. British Mk XVII contact sea mine. A display dedicated to the Army Medical services. A training model of an air dropped British A-Bomb. Equipment used by Indian troops in British service. Locally made weapons used in the Indian independence conflicts. Some posters used in Anti-War protests. Some Cold War communist bloc items. British BD jacket from the Korean war period. The war in the jungle (WW2) display. The display of items from the Holocaust in Europe. A sad reminder of September 11 in New York. This is a really interesting museum. The IWM had a 'Timeline' display on taking visitors on a journey from WW1 to the present day. 100 - thank you all!